If you have downloaded videos from Youtube or similar sites, you might be familiar with the FLV format files. It is commonly known as the Flash Vide format used to deliver video over the Internet using the Adobe Flash Player. But it is pretty hard to edit the FLV videos with your usual tools like Windows Movie Maker even though you can play it with free media player like VLC. 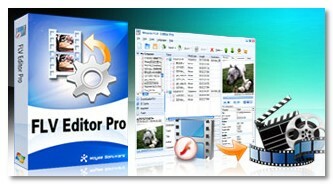 FLV Editor Pro from FlvSoft.com provides a rich set of features that let you edit FLV videos and add professional effects. Convert FLV videos into other formats such as 3GP, MP4, Windows Media, etc. FLV Editor Pro usually sells for $49.95 but they are giving it away for FREE today. Get it as soon as you can as this giveaway will last just today! Here’s wishing you a Happy 2009! thanks for the heads up, heading now would like to get it free. If there is any free giveaway for it, I would definitely try one. Wishing you Happy New Year! This is great, I will recommend it to my visitors as well. Damn, I missed it. I guess I gotta go and search for a free flv editor now. I would have liked to experiment with this to see how I can edit FLV files. I am new here and it is a pity I didn’t visit your blog on December, 29. I think the offering is quite interesting. So I will have to get it for $49.95.